This book is divided into five sections. After your students complete the first two sections, you can proceed with any of the other sections. To begin, chapter 7 presents the jQuery selectors, methods, and event methods that are used the most. Then, the next four chapters build on that base as they focus on effects and animations, DOM manipulation and traversal, forms and data validation, the many plugins that are available for jQuery, and how to create your own plugins. When your students complete this section, they can go on to any of the three sections that follow. The jQuery UI (User Interface) library helps you build common but useful features into a website...with just a few lines of code. So this section shows how to use jQuery UI to create widgets like tabs, accordions, and datepickers...interactions like draggable, droppable, and sortable...and effects like color and class transitions. So in this section, your students will learn how to use jQuery with Ajax and JSON to deliver data to your websites. First, they’ll learn the basics. Then, they’ll learn how to work with the APIs for websites like Blogger, YouTube, Flickr, and Google Maps to add popular content to their pages. This is a major use of Ajax and JSON…yet no other jQuery book that we’ve seen shows you how to do it. It shows how to use jQuery for Ajax and JSON. That takes your students to another level. It shows how to use jQuery with common APIs like Blogger, YouTube, and Flickr. This is sure to add interest to a course...and interest is a great motivator. It shows how to use jQuery Mobile for building mobile websites. 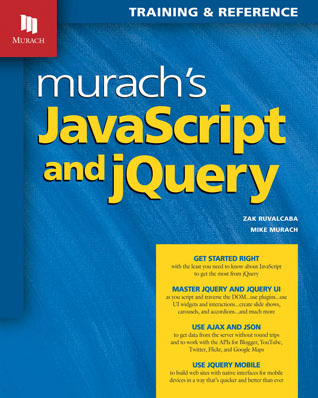 If you review the features and content of this book, you’ll see why we believe it is clearly the best book for a jQuery course. It covers all of the most-used features of jQuery…and much more. And it presents jQuery in a way that’s designed to make learning quick and interesting for students. To test their web pages, your students can use the default browser on their systems. But we recommend that they also test their pages in Mozilla Firefox, which includes a terrific debugging tool called Firebug. In practice, they should also test their pages in Chrome and maybe Opera, but that isn’t necessary when they’re learning. To help your students install these products, Appendix A provides the procedures they’ll need. In addition, chapter 1 presents a short tutorial on using Aptana, and chapter 4 shows how to use Firebug for debugging pages that are rendered in Firefox. After your students complete the first two sections of this book, you can continue with any of the other sections. In other words, sections 3, 4, and 5 are written as independent modules that require only sections 1 and 2 as prerequisites. That lets you choose the subjects that you want to teach as well as the sequence in which you teach them. Beyond that, you have some options as to which chapters you assign for each section of the book. Those options are described in the topics that follow. The five chapters of section 2 present the core jQuery concepts and skills. After chapter 7 presents a substantial subset of jQuery, the next four chapters expand upon those skills. Note, however, that you don’t have to teach all of those chapters and you don’t have to teach them in sequence. If, for example, you want to teach the use of plugins right after chapter 7 and then go back to chapter 8, you can do that. Or, if you want to skip chapter 9 on DOM manipulation and traversal or chapter 10 on forms and data validation, you can do that. You should, however, teach chapters 7 (core skills), 8 (effects), and 11 (plugins) before you go on to another section. The two chapters of section 3 show how to use jQuery UI to enhance a web page. Although these chapters should be taught in sequence, remember that you can skip this section if you want to go to section 4 or 5 next. Another option is to assign chapter 12on jQuery UI themes and widgets and skip chapter 13 on interactions and effects. The three chapters in this section show how to use Ajax and JSON to update a web page without reloading it. They also show how to use Ajax and JSON with the APIs for popular websites like Blogger, YouTube, Flickr, and Google Maps. But here again, you have some options. In particular, you can teach just the first chapter in this section (chapter 14), just the first two chapters, or all three chapters. The two chapters in this section show how to use jQuery to build mobile websites. Since these chapters don’t directly use jQuery methods or event methods, these chapters are relatively easy. As a result, you may want to assign one or both of them when you think your students need a relaxing interlude. “After reading Chapter 7, I skipped to Chapter 17. Within two hours I had rebuilt a mobile website using jQuery Mobile. A friend was interested in themes and widgets, so I did Chapter 12 next. Once again within a short time I had rebuilt some pages using jQuery UI with very satisfying results. Finally, I got back to Chapter 9 about DOM manipulation. The information here solved a problem that had me frustrated. This is an amazing book!" A mobile web site for Vecta Corp.
An enhanced mobile web site for Vecta Corp. Appendix A in the book gives your students complete instructions for downloading and installing these items on a PC or Mac. Below are the answers to the questions that have come up most often about this book. If you have any questions that aren’t answered here, please email us. Thanks! What do I do if I get this error when installing Aptana Studio 3: “Failed to correctly acquire installer_nodejs_windows.msi fle: CRC error”? This error message indicates that you don’t have a version of Node.js on your computer that is compatible with the version of Aptana that you’re installing. If you see this message, exit from the Aptana installer. Then, go to this website address to automatically download an installer file named node-v0.10.13-x86.msi: http://go.aptana.com/installer_nodejs_windows. Finally, run this installer file. After that, you should be able to install Aptana without any problem. How do I create a project from the downloadable folders if I’m using Aptana Studio 3.4 or later? The instructions on pages 34 and 35 of our book for creating a project from the folder that contains the downloadable applications for the book was written for Aptana Studio 3.0, which was the current version when the book was published. Since then, Aptana Studio 3.4 has been released, and you can no longer use the same procedure to create a project from an existing folder. Instead, you have to import the folder as a new project. To import a folder, use the File→Import command to start the Import wizard. Then, in the first dialog box, expand the General folder, select Existing Folder as New Project, and click the Next button. In the next dialog box, enter or browse to the folder that contains the project files. Then, enter a name for the project, make sure the Web – Primary project type is selected, and click the Finish button. Why did some of the book applications stop working when jQuery 1.9 was released in January 2013? The January 2013 release of jQuery, jQuery 1.9, had changes that affected applications that were written under earlier releases. Unfortunately, this release broke some of the applications in our book. Fortunately, we discovered the problem early and fixed this in the downloads for this book on January 25, 2013. As a result, all of the applications should work unless you downloaded the applications before that date. If you did download the applications before January 25, 2013, you should either download them again OR make the change that follows to any applications that don’t work correctly. Why don’t the YouTube applications work? When YouTube upgraded its Data API v1 to API v2, the applications described on pages 440-448 of our jQuery book stopped working. That’s because Data API v1 no longer allows “free” connections to the YouTube Data API feed. YouTube now performs OAuth authorization by checking for the presence of a local file (typically named auth.js) that contains authorization credentials in the form of a client ID. The file containing the authorization credentials is then linked into the web page making the JSON request. Also of note, the YouTube Data API v2 is now deprecated. The current version of the YouTube Data API is version 3.0. Because of the fluid nature of this API, YouTube applications like the ones in the book no longer make sense. Why don’t the Twitter applications work? When Twitter upgraded to API 1.1, the applications described on pages 452-457 of our jQuery book stopped working. That’s because API 1.1 no longer allows “free” connections to the Twitter JSON API feed. Now, to access that feed, you have to register an application with Twitter, add an authentication token to your site, and consume both the OAuth class and the classic server_messages class. Because of these difficulties, Twitter applications like the ones in our book are no longer practical. We fixed the downloads for this book on January 25, 2013. And we fixed the text in its second printing in September 2013. So if you have a copy of the book from the second or subsequent printing, these corrections won’t be an issue. The number on the right of this sequence tells which printing your book is. In this example, it’s the second printing.